Homecrest Takes Survival of the Fittest to Revival of the Fittest - Wadena, MN has been home for the Homecrest Outdoor Living furniture manufacturer for nearly 60 years. 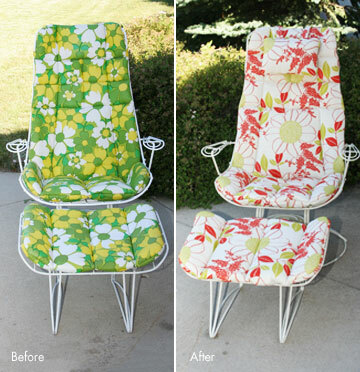 Homecrest's Vintage Wire collection is still gracing the patios of many homes! How many outdoor furniture manufacturers can say that! These pieces contain the Bottemiller swivel rocker mechanism, patented in 1956, that was the foundation of Homecrest's outdoor furniture line. For over ten years (1960-1970's) the all welded steel construction with smooth eight ball swivel bearings, time tested floating comfort rocker springs, roll away base, baked on enamel over bonderized steel was manufactured. With all of that said, no wonder it's still out there today! Just as old classic American cars have withstood the outdoor elements, so has Homecrest furniture. 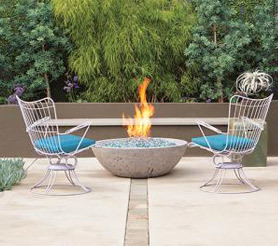 Homecrest can put claims to a truly 'green' story with the Vintage Wire collection. Now over 40 years old, Homecrest's Vintage Wire collection, has continually livened up patios all across the United States. They are proud to display the 'Made in the USA' tag on all of their durable collection pieces. 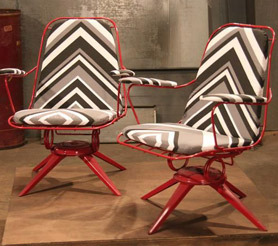 Homecrest's B25 chairs from the 1960s had a facelift on HGTV's Flea Market Flip. 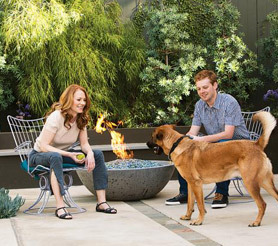 Homecrest Vintage in Celebrities Backyards! 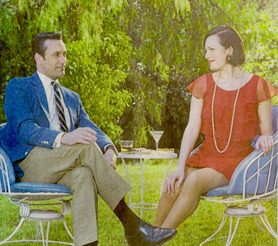 Connect with us on Pinterest and Facebook to view more Homecrest Vintage photos!